Celebrate with style, these stunning one of a kind earrings were designed by US Jewelry Designer Hecht. 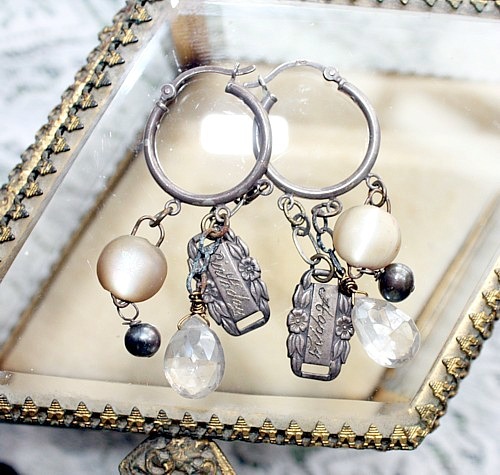 She combined patina Sterling Hoops, two vintage Sterling Silver bands "Happy" and "Birthday" along with antique mother of pearl beads, vintage little crystal briollettes, and a petite fresh water Pearl. Perfect to celebrate YOU, or your Best friend. A special gift to present to the birthday girl. A more than fun addition to your jewelry collection! One of a kind, a little quirky, but what fun! Measure 2~1/8" l.